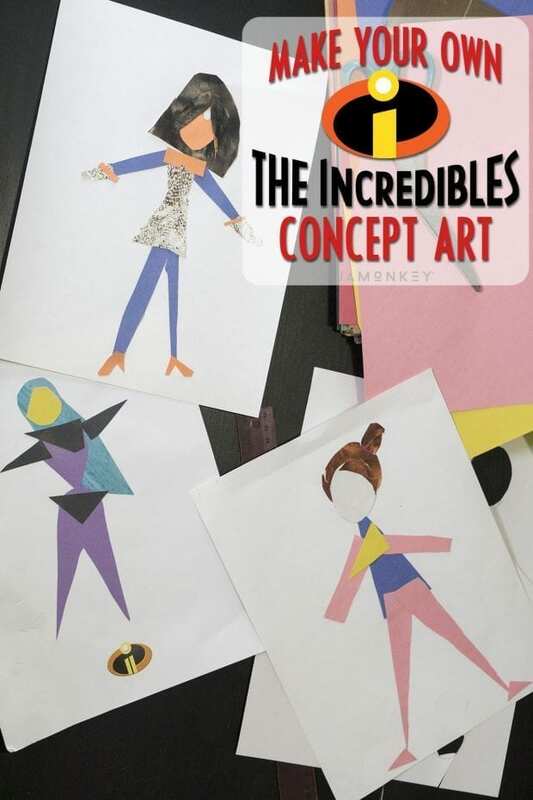 The Incredibles 2 comes out June 15 and to celebrate we are making a fun art project just like the animators at Disney Pixar Studios do when they are creating new characters. Turn yourself into a Super by creating concept art. 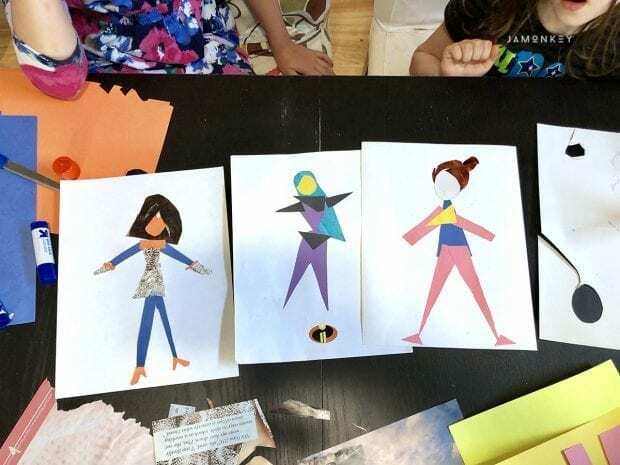 I was invited to attend a press event at Pixar Studios in San Francisco and while we were there they had us create a Super that represents us and what we think our superpowers would be. I had so much fun doing the craft that I knew I wanted to do it with the kids when I got home. We sat down with Alonso Martinez who is a Digital Modeler and Rigger at Pixar Studios. He helps to give the characters facial features and movement like smiling or how the lips move while talking. He showed us a clip of a character that he created that was inspired by Tom Petty and showed us that because of the shape of the mouth and teeth, it causes the character to talk out of the side of his mouth. It was very interesting to see. Check out our video making Supers and hearing from Alonso Martinez. You'll also find inspiration for other Super concept art looks. 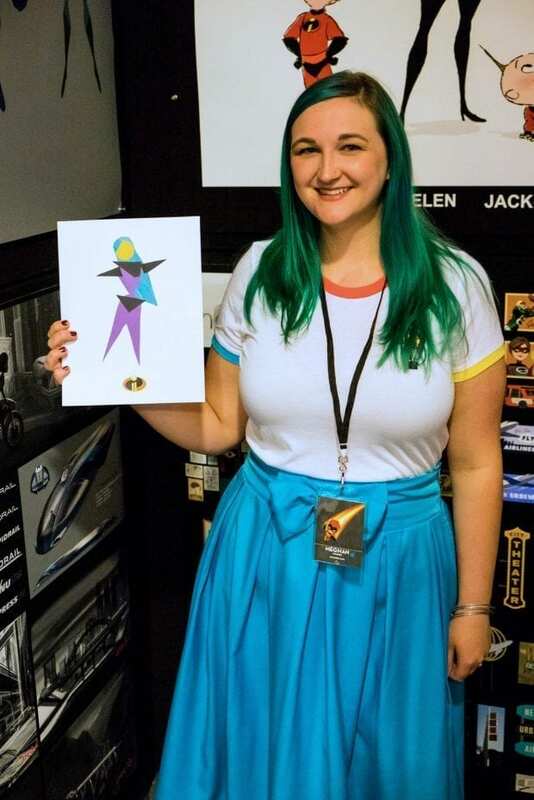 Creating the concept art for The Incredibles and Incredibles 2 was done by using a shape line. It's a basic shape that acts as the starting point. Supervising Animator Tony Fucile demonstrated this live by drawing basic shapes of a dome, heart, circle, square, and oval transforming them into Mr. Incredible, Mrs. Incredible, Dash, and Jack-Jack. You don't realize how simple these characters are until you break them down to the first shape of the head. This is the simple concept behind the art in this project. You don't want to go overboard with colors and textures so it's best to stick with two main colors for your Super's outfit and then something to give it some texture like a piece of scrap paper or magazine clipping of patterns or even hair for the hair. Sheet of cardstock to place your design. Here is the Super I made while I was visiting Pixar Studios. I found a piece of scrapbook paper that was teal to match my hair. I made her hair really long down her back. This is also her superpower. She can turn her hair into a water weapon. I showed the girls some of the other blogger's Super designs to give them an idea of what the concept art can look like. That it's simple and you don't need the little details like eyes and hands. It's just a basic design. Here is what they came up with. 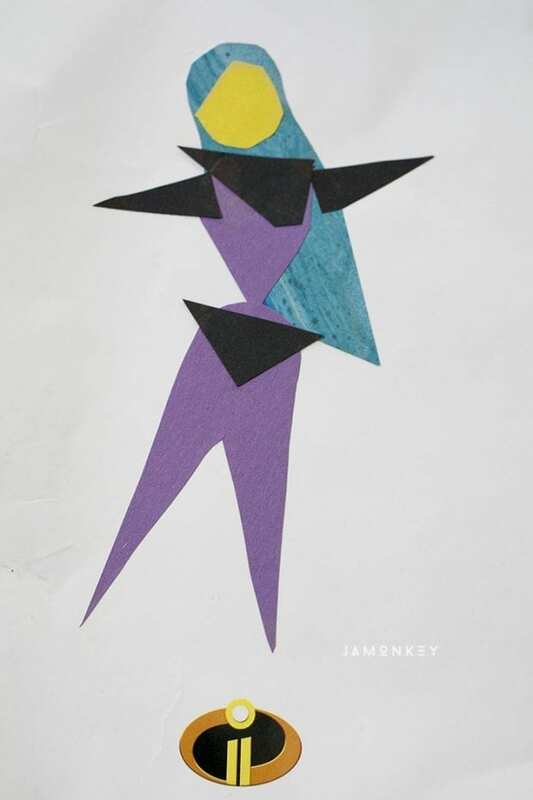 JaMonkey called her Super Vinosis of Many Disguises. She can randomly shapeshift into any disguise. She also has a pearl on her forehead that allows her to use telekinesis. Squish made her Super with long legs like Elastigirl so she decided to call her Rubbergirl. She gave her Super a cute hair bun as well. 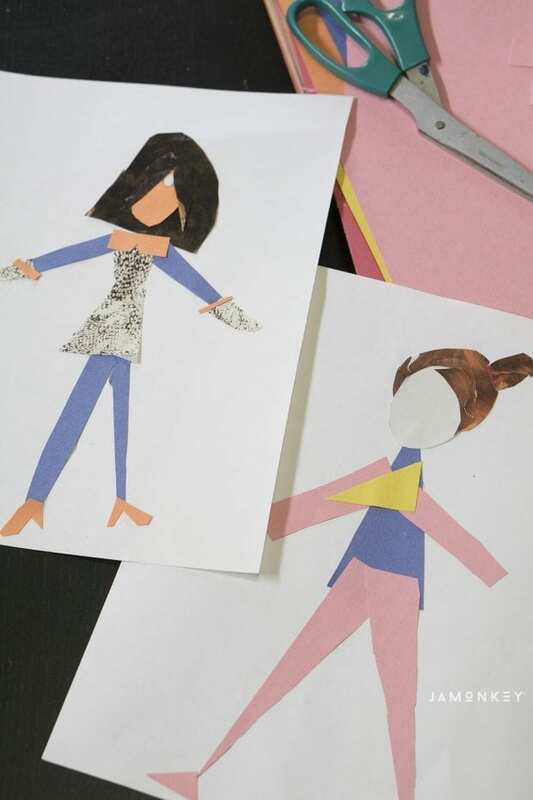 This is a great craft to do with your kids to show them how the animators come up with character concepts for their animations before the finer details are drawn out. 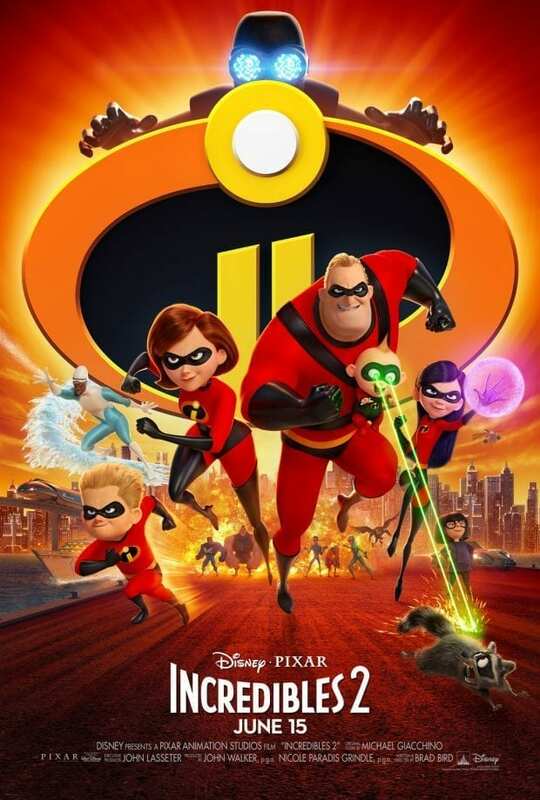 Don't miss Incredibles 2 in theaters June 15th! The “shape language” reminds me of when Sadness, Joy and Bing Bong went “abstract” in the abstract thought room! I like Squish’s hair shapes! Yes and the concept art would be similar to that abstract part. No details! Water weapon hair! I love it!